It’s my lunch break right now (from grading grading graaading), and I want to take this change to blog a little bit about what I did yesterday (and if you think that Waking Mars is closely connected to my Sunday, then you’re right :-) ). I spent bits of last week in between teaching and then basically all of Friday and Saturday grading, and while the grading is not finished (I’m doing some more of it today, as you can see), it was the weekend after all – and I needed a day off. But I didn’t want to do much, or start something I couldn’t get finished in one day, and none of the books in my TBR shelf appealed to me … I really wanted something to just absorb my attention for a couple of hours and then let me go again so I could wholly concentrate on grading again today … and so I went looking for an Ipad game where you don’t walk around shooting people (I don’t play those kinds of games) but get to build/discover/… a world/something that doesn’t involve also needing to build up an army and/or attacking people and/or random people showing up to attack you*. I’ve been slowly making my way through the “Medieval Sims” (which is fun, but totally repetitive), and so googled “game like mediveal sims ipad” or some such, and found a page where someone, amongst other games, recommended “Waking Mars”. It’s not really like the “Sims Medieval” at all (except its more so than, oh, Minesweeper or Tetris or…), but that’s neither here nor there. So I went looking, read the abstract and some reviews, and bought it, no further knowledge available. And I think that was the perfect way of going about it, as the trailer (which I link to down below) actually shows you too many things you otherwise get to discover on your own (so I’m actually saying play it without watching the trailer, but watch the trailer if you otherwise won’t give the game a thought, IDK). “Waking Mars” is the best game I’ve played on my Ipad, hands down. I played it on the “Casual” setting, because I am the kind of person who gets annoyed when I get stuck too often or die too often when I just want to have a nice and non-stressful couple of hours (grrr) – and I thought I might be able to watch the Biathlon World Championships with half an eye while playing (haha, no way, forget it). It took me about 9 hours to finish it – I imagine it takes quite a bit longer in the harder modes – and that was about perfect for me. Don’t get me wrong, I’d have happily kept playing for another couple of hours, and I’d totally have bought “Waking Mars II” last night already if it were available, but it worked really well the way it went. (I still want to *spoiler* so I need to *spoiler*, but as far as game achievements go, I’m finished). The graphics are great and the voice acting is really well done (I can’t say anything about the music because I always switch the music off as a matter of course [it annoys me, no matter how good]), and the navigation was intuitive to learn. And the balance between being taught things and figuring things out on my own worked really well for me. Also the *spoiler* was a really nice touch. It’s a Tiger Style Games game and they have a trailer online (though the game is even better than the trailer), and while I played it on the Ipad it’s also out for most every other system out there, it seems. And I can totally recommend it! Like I said, its the best game I’ve yet played on my Ipad. And now, back to grading (grading grading graaading). *Hence no “Civilization” – you can either set everyone as being your friend, and then it gets really boring really quickly, or always be attacked when all you want to do is build things. If I want to play a game where I attack people (and the last one of those I played seriously was, uh, “Diablo I”), then I pick one of those. When I want to build things, I want to build them. There. I returned from Regensburg yesterday but didn’t do very much except unpack, look at my work preparation for today* and go to sleep, and today it’s been classes and meetings and composing exams and thinking about next term and what novels to put on the reading list for the BA 6 project and so there’s not much to relate that’s non-work. I’ve also had what I hope is but a tension headache since around noon and it’s being resistant to paracetamol, so I’ll go and see whether sleep will do the trick instead – it’s at the point where distraction works well enough for long enough stretches of time so that I got a good amount of work done anyway, and then took it as an excuse to finally watch Juliet & Julia. Alas, I have no great feelings about the movie to relate, other than that Meryl Streep is brilliant as always, and I’d totally buy that cookbook now, if it wasn’t for how I ought really not to have butter, and dairy and gluten are out as well. But the rest of the movie … well, I’ve seen better and I’ve seen worse. Lukewarm feelings persist. So, yes, that is the excitement that was my Tuesday. Gotta go and liberate the washing from the tumble drier now, and then go and hopefully sleep this headache away. The next few days are going to be busy! * A day that included the last session [ :-( ] of my “American Short Fiction” class. We disussed John Cheever’s short story “The World of Apples,” which has one of my (many) first sentences: “Asa Bascomb, the old laureate, wandered around his work-house or study — he had never been able to settle on a name for a house where one wrote poetry — swatting hornets with a copy of La Stampa and wondering why he had never been given the Nobel Prize.” How’s that for an intriguing start? Do you have any favourite first sentences? What are they? 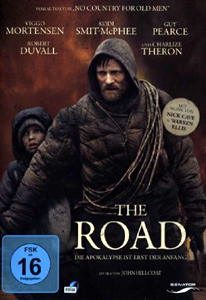 I just watched the movie they made of Cormac McCarthy’s book The Road – a bit tardily, I realize, as it was in cinemas a while ago, but since the book features in my thesis I did not want to watch the movie before I had finished writing about the book. I dreaded watching this movie a bit, to be honest, both out of a combination of the grim subject matter and the doubt that they could really do the book justice, and alas, I was right on that second account. Some of the really gory bits are in the movie all right, but they are entirely not as horrible in the movie as they are in the book, because McCarthy’s descriptions makes them feel much closer, since he usually uses the most beautiful language to talk about the most heinous things, and thus makes them far more disturbing than a non-aestheticising depiction of them is. The acting is overall fine (outstanding in some cases), some of the imagery and mise-en-scene are beautifully done, but the depth the novel has is entirely missing. They’ve shorn all the complexity out of the novel and turned it into this straightforward (somewhat shallow) story, and twisted the religious complexities to boot – the interaction between Ely and the man is … not what it could be, and they’ve left out the entire complexity that the flare pistol has. –> The philosophical depth: gone. Also, visually, the world is entirely not dark and bleak enough. (I could get nit-picky here about a lot of things [the boats! ], but I shall refrain, both to not post too many spoilers and because I think few people actually want to read a list of my complaints, right? Or observations about the interesting choice of using voice-over for parts of the movie – it gives the father a narrative agency that is quite different from the book [but a viable alternative to lots of establishing shots]. Some of those voice-overs are good, some … not so much). Good actors let down by a strangely lacking and shallow script. A shame. So: if you know neither the book nor the movie do yourself a favour: read the book. If you love the movie for what it is: don’t read the book. If you like Viggo Mortensen: yeah, okay, go on and watch the movie, then (though I don’t think it’s his best work, either). Things to do on a winter night, possibly when slightly feverish and a bit woozy and out of it from any number of drugs: sit or lie in the dark (on a comfortable rug in front of a blazing fire, if available), put on headphones (so as not to disturb the sleeping fellow inhabitants of the house, and for a greater feeling of intimacy) and listen to Indochine’s Nuits Intimes – I got the CD for Christmas and have listened to it any number of times since, in various settings (on a train, as background music while writing, on the go on the iphone, … ), but the name is definitely defining for it, and it is best suited to, well, intimate listening at night, and less to bright sunshine and crowded trains or excercise, or … . It contains acoustic versions of both Indochine classics and (at the time of its recording) current Indochine songs, ranging from minimal instrumentation with just one guitar to more elaborate arrangements, but they all, throughout their simplicity or elaborateness, manage to remain – intimate, for lack of a better word. I personally like the slower and more pensive pieces, as well as the less instrumentalized ones better than the more uptempo and more elaborate ones, but they’re all lovely acoustic and personal versions. Indochine for me are definitely a case of music discovered via modern media – I remember catching 20 minutes or so of a documentary about them late one night while zapping channels (must have been on ARTE I think) and being intrigued by some of the clips they showed – intrigued enough to look around for some clips on youtube and in other places, and first listening to them via the things I found online. Which led me to acquiring physical copies of their albums, as well as bying mp3 versions of some of their back catalogue (Itunes makes that really really easy), and to me now following them on facebook waiting for tour dates to be announced (they’re playing two gigs, in the middle of next week, in Paris. Not helpful! Though, I admit, if it weren’t term time that might be a different story …). I don’t think I would have gone and tried to find a CD in a shop from the brief glimpse on TV. I might have, but the action threshhold would have been much greater (write name down, trundle off to shop where chances are high no CD would have been available, as I don’t think Mannheim is high on French (new wave) rock (I was still living in Mannheim when I first encountered them), have one ordered blind, trundle back to shop, listen, …), and I am glad that wasn’t tested, as I would probably have missed out on some lovely music that way. There used to be a lovely shop in Mannheim for CDs, though, call Prinz (which since closed down [because of some problems with their rental contract, AFAIK]). Its where I first listened to (and failed to buy) Stockhausen’s Helicopter String Quartet. Which they had readily available, come to think of it. So maybe I am doing them an injustice thinking they wouldn’t have had any Indochine. I am pretty sure that no record store in Flensburg currently has an Indochine record, though. Will check that theory when I am next in the city. 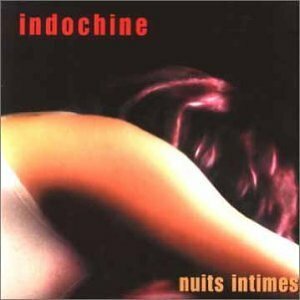 And, uh, in case you’re curious about Indochine now, here’s a link to their official youtube channel. (Some of the videos even work in Germany, no thanks to the GEMA [they’re blocking 95% of an official channel intended to exist by the band and its management as advertisement … kind of counter-productive, non?] Never mind…). If you can get them to work, check out ‘J’ai demandé à la lune’ for one of my favourite Indochine songs, or ‘L’aventurier’ for one of their most famous ones. The story is overly dramatic for me, in part (I didn’t need the whole show to cap on the francincense being used in Bethlehem at Christmas for it to be a good documentary), but not annyoing-me-into-stopping so, and the pictures are gorgeous. I can’t say how accurate everything presented in the documentary is (I don’t know enough about the non-Byzantine history of the region and I’d actually never really wondered where francincense came from, or how it was transported in ancient times – not that that is truly at the center of the show), and it’s a lot more a charming and sometimes silly travelogue than a fact-heavy documentary. I think it is worth watching it for the gorgeous landscapes and the people that are encountered, even if some of the situtions seem contrieved. You learn more about camel jumping and camel herding than about francincense, but I didn’t mind, and watched all four hours back-to-back. (And shall now google more info about francincense). I am not sure yet if the presenter was charmingly uninformed or annoyingly vague and culturally insensitive, though. Her charisma was not bad, but some of her interactions with and reactions to the people she encountered had me go “urm…” and “culturally insensitive much?!?! HELLO?!?!?”. Anyway: superb and well-shot landscapes, survivable narration, not a lot of cultural sensitivity or hard facts about francincense. Has anyone else seen it? What did you think? Also: Read Edward Said’s Orientalism. To speak impartially, both sayings are very true; That Man to Man is a kind of God; and that Man to Man is an arrant Wolfe. The first is true, if we compare Citizens amongst themselves; and the second, if we compare Cities. In the one, there’s some analogie of similitude with the Deity, to wit, Justice and Charity, the twin-sisters of peace: But in the other, Good men must defend themselves by taking to them for a Sanctuary the two daughters of War, Deceipt and Violence: that is in plaine termes a meer brutall Rapacity: which although men object to one another as a reproach, by an inbred custome which they have of beholding their own actions in the persons of other men, wherein, as in a Mirroir, all things on the left side appeare to be on the right, & all things on the right side to be as plainly on the left; yet the naturall right of preservation which we all receive from the uncontroulable Dictates of Necessity, will not admit it to be a Vice, though it confesse it to be an Unhappinesse. So really, man is both, depending on any number of things. It’s all in the preface of De Cive (a handy link to which I provide right here), if you want to read the complete context. Still, writing about Hobbes mean reading up on the context of the quote, and that was an unexpected investment of two hours or so, and getting to Hobbes via Annette Kolodny’s The Lay of the Land also was not fast, and neither were really what I set out to write today, but showed themselves as being necessary ingredients at some point anyhow. Then I watched Illuminati: Angels & Demons, because it was on TV at about the time I stopped writing (I’d say “was done writing,” but the truth is, an academic is *never* done writing, you only stop due to exhaustion or because you run out of time). It was … not as bad as the Da Vinci Code was, and – maybe because I did some puttering around etc while it was on – I did not see the plot-twist with the one dude coming, at least not until they wanted to turn him into the head dude of all dudes. Then I was like … no, there’s still 20 minutes of the movie left, that can’t be right. Also, aren’t you a bit young, and isn’t fountain guy destined for that job? (I know, vague writing is vague, but I am trying to avoid spoiling the movie in case you haven’t seen it yet). I think it ought to make sense if you actually have seen it. Also: where is Jesus’ great-great-great-great-…-grand-daughter? Weren’t they, like, romancing it up? (I know, he wrote Angels & Demons before the DVC, but in the movie they refer to the DVC, so they could have easliy included a thow-away mention amongst all the other throw-away mentions …). Though really: I’m not that invested. And it only took me about an hour to recognize Ewan McGregor. (In my defense: Star Wars I – III, I have not seen them! Nor do I want to.) So, that was my day. How was yours? In a spout of “oh dear, it cost me 715 fricking Euros to have my car fixed today” (talk about OUCH!) and having spent 10+ hours at work plus also rushing around collecting said car and getting home late, I decided to take it easy tonight and settle in for what I expected to be pretty unsurprising movie watching, and poured myself a glass of rosé (it’s a lovely Syrah rosé, very mellow and laid back) and made one of the lactose free frozen pizzas the existence of which I recently discovered (it’s a perfectly average frozen pizza) and decided to put on Secretariat. Now, the story is familiar, and its a Disney film about a horse, so there aren’t bound to be any surprises … and there weren’t, really. You get exactly what you expect to get. (Except for someone’s below average taste in music, alas.) The movie coasts along, nice and mellow, the drama is expectedly ever so slightly over the top, the camera work on the different races is quite interesting and sometimes innovative … and then along comes the music and totally kills the rest of the movie dead under about a ton of vocals and metaphorical icing, drowning out both the acting and the images (let alone the speech) by being too loud and really rather absolutely unfitting. I mean, what’s going on with the blaringly loud and strangely paced gospels? Is the horse Jesus, is that what you are saying? What’s going on? (That’s what the music in combination with the editing totally makes it look like). I’m sorry, but no. All that music does is jerk you right out of your mellow state of watchfulness into glaring WTF-is-this land, and kill all, all the tension you’re so laboriously building! Also: the movie has no ending. It just stops at some point, but it does provide zero closure on anything besides the question of whether or not Secretariat will win the Belmont. The tension between numerous different human individuals builds and builds and then chop, climax, endtitles, and you sit there squarely dropped into whuh?-did-I-fall-asleep-for-two-minutes-?-land? No conclusion, no closure, nothing. Very strange. Were they only allowed to make a two hour movie (it’s 118 minutes long) and ran out of time? So, yeah, while I didn’t expect to love it madly and deeply, I also didn’t expect to mind it, but after watching it I kind of mind it more than I thought I would, unfortunately. I think that most everyone has a certain song, or a number of songs, that always (or most always) help them to improve their mood, or that one associates cheerfulness with, or safety, or mellowness, or any number of emotions. (And the same might be true for songs that never fail to make one sad). I know I certainly do have songs that can cheer me up, and today I just want to share one of them with you, rather randomly, and mostly because I’ve been listening to it on repeat on the way home just now. There are a number of interesting adaptations of the song on youtube, some better than others, but unfortunately none of them comes close to the original. But the internet is wide and varied, and if youtube does not have what you are looking for, some other video portal surely will. 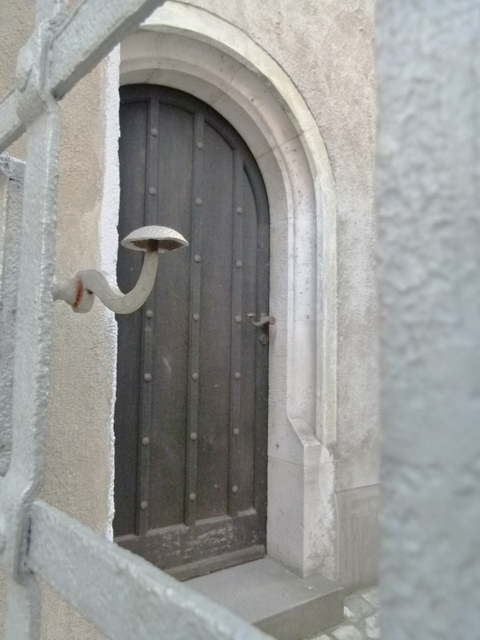 Thus: if you’re so inclined, this way to the Coultergeist. 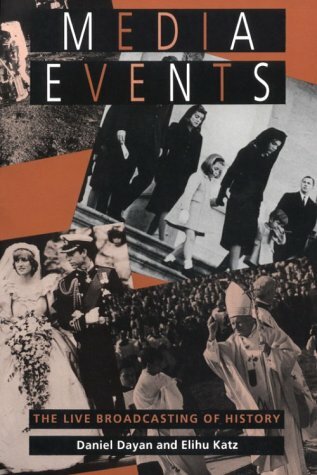 So, on Friday I wanted to blog a little about Elihu Katz & Daniel Dayan’s book Media Events – the live broadcasting of history, since that would have been something tied in perfectly with the royal wedding taking place in England. Instead, I found out that my copy of Media Events has gone missing from my media studies bookshelves, and a 30-minute investigation showed that it’s not simply been misfiled into a different subject area (yes, I sort my books by subject areas, rather than by authors – I am bad at remembering names, so it makes for a much better system than running an a-to-z [Hey, Mr. Atoz!] shelving system across two different rooms) but has, in fact, gone missing. I suspect I lent it to someone and forgot all about it (I often do). Thankfully, at least part of it is available on google books, so I can offer you a (critical) reading recommendation peppered with some quotes (if maybe not the most central ones, filtered through my five colour marking system :-) ). Katz & Dayan, Media Events – what is the book about? Media Events concerns itself with what Katz and Dayan call “the festive viewing of television,” with “Contests, Conquests, and Coronations” (1), that are “live and remote, on the one hand, and interrupt[ive] but preplanned, on the other” (7). Thus, live and remote excludes a) studio programs that might be broadcast live, but that are not happening in a location remote from the studio (news programs, chat shows, …), and b) remotely filmed but pre-recorded television series, documentaries and shows like Roots or The 10’000 Day War or … . Thus, it is about the live broadcasting of remote (filmed outside the studio) events on television, but about premediated events instead of spontaneous events. Events that have been scheduled in advance and that interrupt the normal scheduling of television stations, rather than sudden occurrences. Thus, both the Olympic Games and the wedding of Prince William and Catherine Middleton fall under the scope of Katz and Dayan’s definition, whereas a) the disintegration of the space shuttle Columbia upon re-entry in 2003 does not (a sudden, not a preplanned event) or b) a weekly talk show taking place on top of a mountain (remote, preplanned, but not interruptive of the normal programming since it is a regular occurence) do not. Why study media events? Katz and Dayan give a number of reasons, amongst which are the following: “media events […] create their own constituencies” (15) … “have the power to declare a holiday, thus to play a part in the civil religion” (16) … “certain events have an intrinsically liberating function, ideologically speaking; they serve a transformative function. However hegemonially sponsored, and however affirmatively read, they invite reexamiation of the status quo and are a reminder that reality falls short of society’s norm” (20) … “the rhetoric of media events is instructive, too, for what it reveals not only about the difference between democratic and totalitarian societies, but also about the difference between journalism and social science, and between popular and academic history” (21). In their book, Katz and Dayan take a look at how these media events are created and negotiated, as well as at their meaning for a feeling of societal union and the conditions under which media persuasion might be effective (222), the “transformative functions” that media events have and that help shape public perceptions and political responses. For me, Katz and Dayan are a tad too uncritical and indescriminate in the theories of the relationship between ritual, culture and society that they use – the view that ceremonial performance is mainly used to express consensus and to accomplish social integration can (and ought) certainly to be questioned (in lieu of a view of society as structured by inequalities and power relations maybe), and viewing broadcasting institutions as independent from governments and political power is also a problematic point. Why then read the book? Dayan, Daniel and Elihu Katz. Media Events. The Live Broadcasting of History. Harvard University Press. Harvard: 1994. HAHAHAHAHA it was sooo baaaad, soooo baaad, sooo baaad. And looked so great while failing so badly. Awesome! Story: terrible (really really terrible, in fact! I suspect that it was written so as to provide for the maximum amount of special effects possible, not for any sort of plot coherence, for there was NONE. No plot, really, except: eeep, look, another special effect we must escape from! Ooops, too late). If you are thinking about seeing it, totally watch it in the cinema – the saving grace in this movie are the gorgeous special effects, and they will work much much better on the big screen. Though if you are not easily enchanted by gorgeous pictures of the world going to pieces: do not watch it at all. * Dog rule: if you want to survive in an Emmerich movie, keep a dog close by. Hand it to someone else = you’re dead. You are currently browsing the archives for the sometimes I review things category.